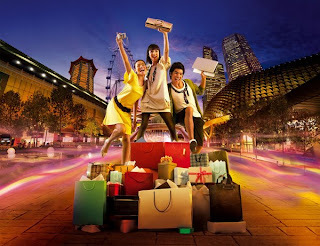 Indian Vanity Case: My Favorite Blog Post 2 ~ Make-up Shopping in Singapore ~ "The Sweet & Helpful"
My Favorite Blog Post 2 ~ Make-up Shopping in Singapore ~ "The Sweet & Helpful"
If you're planning to visit Singapore any time, you might also find this very helpful. Tips: If you're visiting Singapore for a makeup shopping trip! This post is specially for you, Cynthia!!! :) I hope you'll find this useful. And for those who happen to want to visit Singapore, here are the best places to go makeup shopping! For international brands like MAC, Estee Lauder, Bobbi Brown, Christian Dior, Chanel, Lancome, Clarins blah blah blah, I would recommend you to get them in the Duty Free at Changi Airport as they are MUCH cheaper than in Orchard Road. For Fancl stuff, you can get it from either their flagship store at Takashimaya, or their counter inside Isetan departmental store (Wisma Atria/ Tampines mall). Isetan has Kose, Dr. Ci Labo, Laneige, Anna Sui, Shu Uemura, RMK, Paul & Joe, Cosme Decort (sp? ), Givenchy, Origins.... the list goes on. Takashimaya also has Coffret D'or, Kanebo and Lunasol! That was a very useful post! Singapore, I'm coming to you soon (hopefully)! I've been hearing a lot of nice things about Singapore, my boss before are Singaporeans and they are really nice people, can speak English fluently too ^_^. BTW Cynths you got a TAG and an AWARD on my blog hehe ^_^. If you come, do try to go to Stardust - a shoppie located in the big shopping hum atop of Dhoby Gaunt MRT - it has some very well stocked shelves of Borjois, Canmake and lot's of other minor Asian brands. I was in Singapore in 2009 - LOVED it. They have every make-up brand under the sun but I found that in Canada they are the cheapest. I think in US they are even more cheap.